As a college student in the early 70s, Steve Baumgartner’s father requested a Boone County Ham for Christmas. Steve knew that Arno Winkler cured hams and asked Mr. Winkler if he could help him cure hams in return for a “free” ham. Steve enjoyed working with Mr. Winkler and became interested in the ham curing process. So for about ten years, Steve always helped Mr. Winkler during curing time. After many years of assisting Mr. Winkler, Steve decided to start his own curing operation in 1988. Mr. Winkler had retired from curing and he agreed to allow Steve to use his “secret” cure. To this day, the cure mixture (brown sugar, salt and pepper) remains the same! Steve is proud to carry on Mr. Winkler’s recipe. Steve Baumgartner (and friends) continues to cure over 300 hams every January. Baumgartner’s Cured Hams meets all requirements set forth by the USDA. Baumgartner’s Cured Hams have been served at the Boone County Fair breakfast for the past 5 years. This breakfast feeds over 800 Boone County ham lovers! Give us a call at (573) 698 – 2895 or email us to inquire about our current product availability. Every Baumgartner Family Country Ham is cured naturally (no preservatives here!) in a salt, brown sugar and pepper mixture over the course of 7 to 8 months giving them their distinct, rich taste. This process is inspected regularly by officials at the US Department of Agriculture who determine when the hams are ready to be released (usually in July of each year). Preparation of a cured ham is very important and if done improperly, can easily ruin the taste. Each order we ship includes detailed instructions for your assistance. While it is not necessary to soak a Baumgartner ham prior to cooking, some individuals who prefer a milder flavor may choose to do so. We generally describe our hams as having a “mildly salty” taste. Our hams are not precooked and do not need refrigeration until they are cut open. Until ready to eat, the ham should be placed in a brown paper bag and hung in a cool, dry place. When you first receive the ham, there may be mold on the surface. This is a completely normal side-effect of the aging process. Simply scrub the mold off with a stiff brush and cook as directed. Our hams can be shipped anywhere in the United States. Because supply is limited, you may want to place orders in advance. The hams are guaranteed. Any order can be replaced or refunded within 30 days of purchase. Vacuum packing for long-term storage is available, but we will need a two-week notice and an additional fee for this service. Soak beans overnight (or at least for a couple of hours). In a large kettle (or crock pot) combine all ingredients with enough water to cover the ingredients. Bring to a boil, reduce heat and simmer until beans are tender. Wash beans then had all ingredients to a crock pot with 4 cups of water (beans should be covered). Cook til beans are done. Place ham slices in warm skillet with equal parts of carbonated beverage and water. When cooking keep liquid covering the bottom of the skillet. Cook meat slowly for 8-10 minutes or until the meat is cooked through. You can use the same liquids and bake the ham (usually the ham will be less salty if baked). Again, make sure the meat is covered while baking. Meat should be cooked with a sealed lid. Bake at 300 degrees til cooked through. Your ham may come with a small to moderate amount of mold on the surface. This is a completely normal side-effect of the aging process. Simply scrub the mold off with a stiff brush and wash with warm water. Place the ham, skin side up, in a deep roaster and add 6 to 8 inches of water. Insert a meat thermometer and cover the lid. 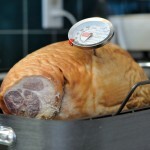 Cook at 325 degrees, making sure the ham simmers but not boils, until the internal temperature reaches 160 degrees. This will take approximately 10 to 13 minutes per pound. Your ham is now ready to eat! Cut slices thin and perpendicular to the bone, starting at the hock end, and serve hot or cold. Check out our Recipes Page to see some delicious ideas for your Baumgartner Country Cured ham.